On Friday, Destiny Herndon De-La Rosa marched in the streets of Washington D.C. alongside tens of thousands of people voicing their opposition to abortion in the annual March for Life. Six days earlier, she was walking those same streets for the Women’s March on Washington, one of dozens of rallies that day organized for women’s rights around the world. 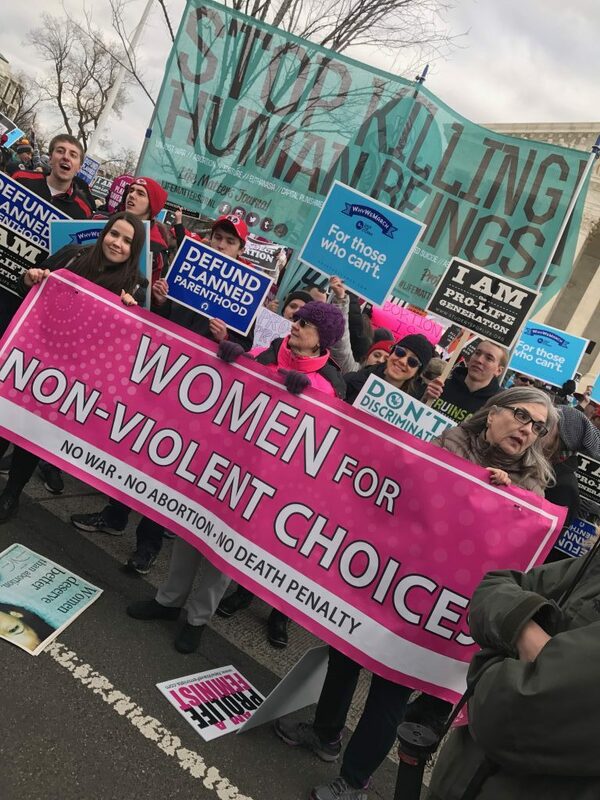 A group of marchers, including the New Wave Feminists, an organization Herndon De La-Rosa founded, hold signs Jan. 27 at the March for Life in Washington, D.C.
“As pro-life feminists we firmly believe in non-violence, and violence against women is never acceptable, even in the womb,” Herndon De-La Rosa said. She founded a group, the New Wave Feminists, for women who share similar views. The group doesn’t advocate for making abortions illegal, as many anti-abortion groups do. Instead, it aims to provide women enough support that they do not feel they need to have an abortion in the first place. Their beliefs have often made them “black sheep” of both the anti-abortion and abortion rights movements. But at both of this year’s marches, Herndon-De La Rosa, who traveled from Dallas for both marches, found spaces to have constructive dialogue. In other words: It’s possible to find a home on both sides of the issue. “We want to address the complexity of each human life,” Herndon De-La Rosa said, adding that the concept encompasses everyone from the unborn child to the abortion clinic worker. That puts them in a unique position during a time of particularly divisive rhetoric in the political sphere. Herndon De-La Rosa’s views were shaped by her own experience: Her mother became pregnant with her at 19 years old, when she was a student at the University of Texas. Despite the fact that having a child would delay her degree significantly, she decided to give birth–an act Herndon De-La Rosa considers courageous. Herndon De-La Rosa herself became pregnant with her first child at age 16 and, following her mother’s example, decided against an abortion. 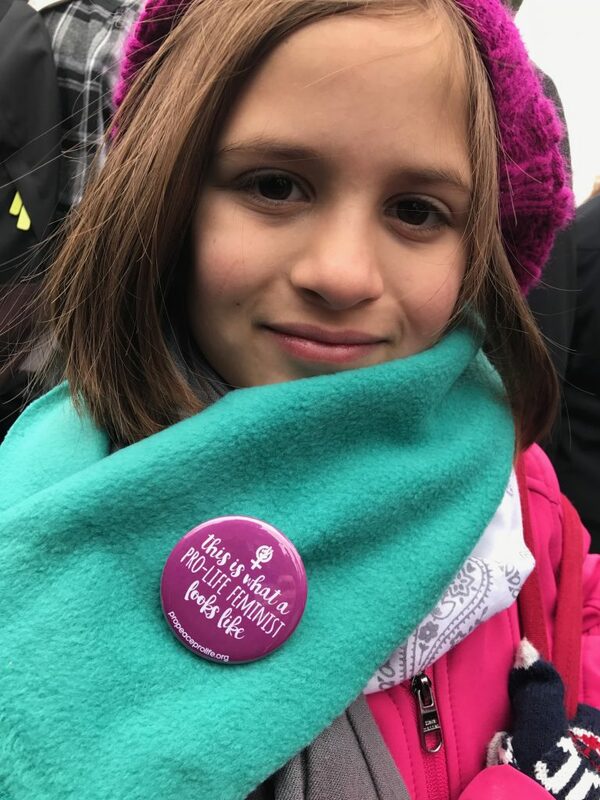 Destiny Herndon De-La Rosa’s daughter Eddie, 8, marched with her mom at the March for Life in Washington, D.C. Photo courtesy of De-La Rosa. 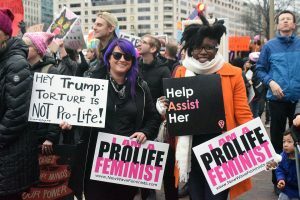 At previous marches, people thought members of New Wave Feminists were abortion rights protesters and would try to cover their signs. This year, though, at both the Women’s March and the March for Life, she’s noticed people’s views are changing. “I’ve had so many women contact us and say, ‘I didn’t know I could be a feminist because I’m pro-life,” she said. At Friday’s March for Life, many of the attendees disagreed with the group’s views–but they were willing, and sometimes eager, to have discussions, Herndon De-La Rosa said. “At the end of the day … the core message of both movements are: We love women, and we want to help them,” she said. Read more of our coverage from the March for Life here. Left: Destiny Herndon De-La Rosa, left, traveled from Dallas to attend both the Women's March and the March for Life. She says the movements shouldn't be seen as working against one another. At the end of the day, both "love women, and we want to help them." Photo by Gretchen Frazee/PBS Newshour.